Explanation: Cassini, a robot spacecraft launched in 1997 by NASA, is close enough now to resolve many rings and moons of its destination planet: Saturn. The spacecraft has closed to about two Earth-Sun separations from the ringed giant. Last month, Cassini snapped several images during an engineering test. These images have been combined into the contrast-enhanced color composite pictured above. Saturn's rings and cloud-tops are visible on the far right, while Titan, its largest moon, is visible as the speck on the lower left. 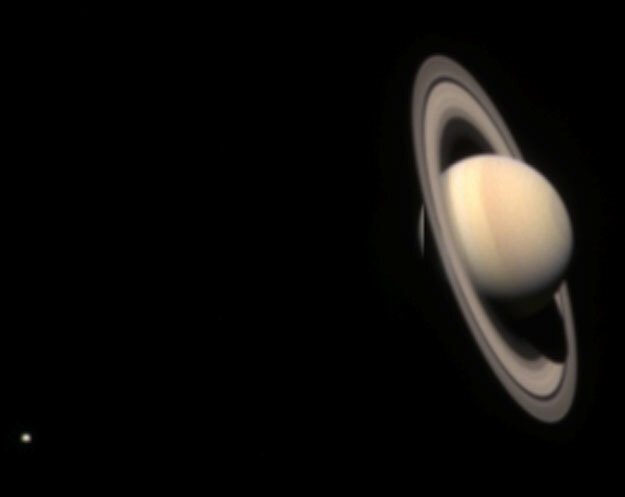 When arriving at Saturn in July 2004, the Cassini orbiter will begin to circle and study the Saturnian system. Several months later, a probe named Huygens will separate and attempt to land on the surface of Titan.